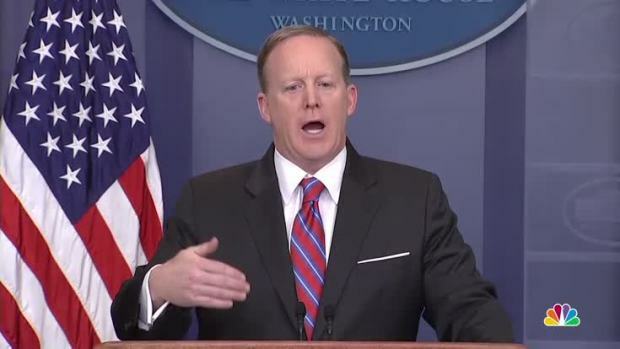 White House press secretary Sean Spicer incorrectly said Tuesday that Nazi leader Adolf Hitler did not "sink to the level of using chemical weapons." Spicer made the comment at Tuesday's daily press briefing when asked about Syria's alleged use of chemical weapons in a bombing of their people. Spicer was arguing that Syrian President Bashar Assad was in some way worse than Hitler, whom he described as "despicable." After several attempts to clarify his remark, Spicer later apologized, calling his remark "insensitive" and a "mistake" in an NBC News interview. "It was a distinction that didn’t need to get made. They’ve both done horrendous, heinous things to innocent people," he said, referring to Hitler and Assad. "To make any kind of comparison is really regrettable and a mistake." Hitler used chemical weapons in systematically killing millions of people as part of the Holocaust and his "Final Solution" of ethnic cleansing. While Hitler killed himself before the end of World War II, some Nazi leaders were convicted of war crimes in its aftermath for their part in the murders. An April 4 chemical weapons attack in northern Syria left nearly 90 people dead, and the U.S. has blamed Assad and condemed the attack, responding with a barrage of cruise missiles on a Syrian military base. Turkey's health minister said Tuesday that test results confirm sarin gas was used. Spicer's comments, which came on the first day of the Jewish holiday Passover, immediately generated outrage on social media. 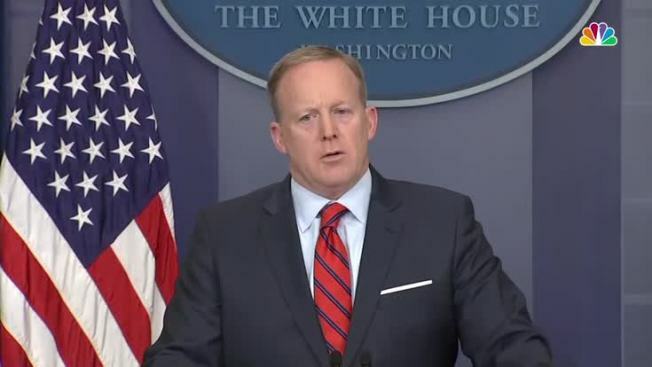 The outrage continued after he attempted to clarify the remark, with the Anne Frank Center calling for Spicer to be fired for engaging in Holocaust denial. Asked what he meant, Spicer said he meant that Hitler was "not using the gas on his own people the same way that Ashad [sic] is doing." While many of those who died in the Nazi gas chambers were brought in from other countries, many were Germans as well. The gas chambers used Zyklon B, a cyanide-based pesticide, for the mass murders of those the Nazis felt were "unworthy of life," according to the U.S. Holocaust Museum. Hitler's victims included Jews, mentally and physically disabled peoples, homosexuals and any political opponents of the Nazi Party or Axis powers. The Holocaust Museum notes that it is extremely difficult to estimate the exact number of people killed by Nazis and Nazi policies because of a lack of documentation. Chelsea Clinton was among those who quickly reacted on Twitter, urging Spicer to visit the nearby museum. The initial remark led some people, like Anne Frank Center Exectuive Director Steven Goldstein, to call for Spicer's firing. "On Passover no less, Sean Spicer has engaged in Holocaust denial, the most offensive form of fake news imaginable, by denying Hitler gassed millions of Jews to death. Spicer's statement is the most evil slur upon a group of people we have ever heard from a White House press secretary," Goldstein said in a statement. Leading House Democrat Nancy Pelosi also released a statement calling for Spicer's dismissal. Rep. Lee Zeldin, a Jewish Republican from New York, said in a statement that "as far as comments being made and comparisons of various tactics and methods between now and World War II, you can make the comparison a little differently and it would be accurate, but it's important to clear up that Hitler did in fact use chemical warfare to murder innocent people." When asked by NBC News if he thought his job was safe, Spicer said: "Well, you know what, I made a mistake. I’m owning up to it. And you know, obviously I expect, I’d hope, that everyone understands that we all make mistakes and ask for forgiveness." Earlier, Spicer had attempted a second clarification after the initial briefing was over: "In no way was I trying to lessen the horrendous nature of the Holocaust, however, I was trying to draw a contrast of the tactic of using airplanes to drop chemical weapons on innocent people." The phrase "Holocaust centers" was trending on Twitter shortly after Spicer's comments, quoting a misstatement Spicer made in reference to concentration camps as he backtracked during the briefing. White House press secretary Sean Spicer and American Urban Radio Networks reporter April Ryan have an exchange at a press briefing on Tuesday, with Spicer telling Ryan to "stop shaking your head" several times. The Trump administration has faced criticism in the past for comments related to the Holocaust and anti-Semitism. The White House released a statement on international Holocaust Remembrance Day earlier this year that did not make any reference to Jews, and some have taken issue with the speed with which Trump has condemned anti-Semitic attacks, including threats against Jewish community centers. Asher Klein and Shannon Ho contributed to this report.